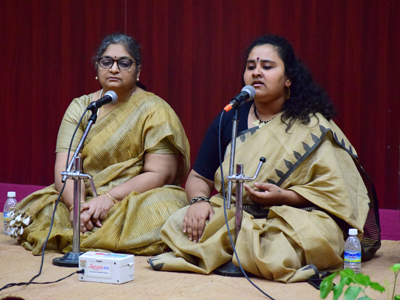 On the evening of February 28, 2019, Sri Aurobindo Foundation for Indian Culture (SAFIC) organized ‘Prema Nirjharini’, its annual musical offering. 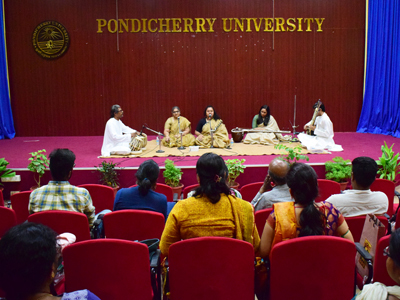 This year, the programme was co-organized with the Centre for Women’s Studies, Pondicherry University, as part of the blossoming collaboration between Sri Aurobindo Society and Pondicherry University. This programme was a part of the University’s two-week-long commemoration organized on the occasion of International Women’s Day of March 8. The programme was held at the School of Management auditorium. Prema Nirjharini – as gentle springs cascade down the mountains, uninhibited, unrestrained, through the ravines and flows into rivulets and rivers, the evening created a similar experience through music. As the Mother said, the true role of music, like the true role of all art, lies in helping the consciousness to uplift itself, to elevate itself – both for the performer and for the connoisseur. Indian classical music, in particular, is intimately linked to the quest to discover a certain kind of truth in itself, an unchanging eternal centre within. 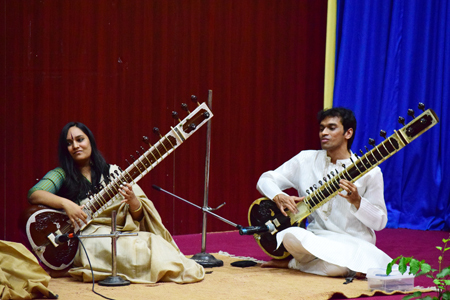 The evening’s music was presented by Temple of Fine Arts, a group which has been offering this special event Prema Nirjharini at Sri Aurobindo Society for several years now. The Temple of Fine Arts is a cultural and service-oriented non-profit organisation with centres in Coimbatore & Chennai, as well as in a few towns in Malaysia, Singapore, Australia and Sri Lanka (Colombo). Founded by His Holiness Swami Shanthanand Saraswathi, the Temple of Fine Arts aspires to be an institution that will help nurture a love for the fine arts. The programme, based on the theme of Nari Shakti, included a few classical renditions, semi-classical bhajans and invocations of the Mother Goddess. The ragas chosen for the evening were all feminine in name and nature, and expressed different aspects of the feminine personality – from her deep compassionate nature to her warrior mode. 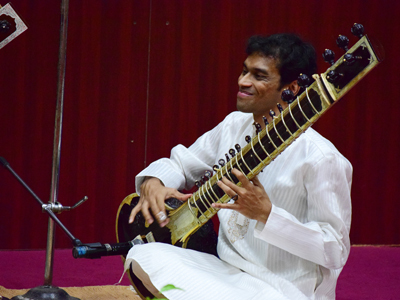 The audience was mesmerized by the strong instrumental performances by S. M. Anand and Vedashruthi Anand on sitar and Augustine Paul on tabla. 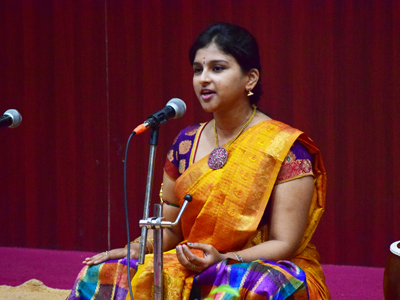 The vocal performers for the evening included: Anusha Gayatri Janaarthanan and Asha Radhakrishnan from the Temple of Fine Arts, and a young student of Carnatic music, Darshana Shree. Hon’ble Vice-Chancellor, Professor Gurmeet Singh, also graced the occasion by his presence and enjoyed the music.